This Russian fleet off the coast of Queensland was a reminder how diminutive Australia is in power and therefore how dependent we are on the US Navy to counter the fleets of great powers. France has built at least one and possibly two Mistral amphibious assault ships, also known as helicopter carriers, for Russia. Russia paid 1.2 billion euros in advance in early 2011, but delivery of the ships has been put on hold indefinitely. The money is still with France. Could this be in part explained because France re-joined NATO in March 2009, and NATO, with Hollande as a cheer leader, was complicit in toppling the elected government of Ukraine in 2014. One objective - the main objective? - was to wrest control of the Black Sea port of Sevastopol from Russia. This objective failed rather spectacularly, with Crimea again a part of Russia as it was before 1954. Also, on November 18th, 2014 Sputnik news reported that the French government has denied access to the Russian training crew for the Mistral ship Vladivostok docked at St. Nazaire. When was Putin made Russian Leader for Life? I thought he was serving a five year term as President. True Australia's conventional defense force is small but we could develop icbm's whenever we need to. Progressive Pat, Australia couldn't fight its way out of a wet paper bag. We would need to beg any potential invader to hold the invasion until we got three of our six submarines working at least some of the time, got our vintage Vietnam helicopters out of mothballs, and received at least a couple of our American SuperDooper Hornets already six or more years late in delivery! As to us producing ICBMs in a hurry, well, the Yanks have probably located them all over Australia without our knowledge so there's probably no room! In the world of war, Australia is a non-event, a drink carrier, a joke. Best thing we can do is to drive the Americans from our shores and become neutral! Your Mistral, Ukraine, France in NATO theory, probably doesn't hold water. Many NATO nations also maintain military commercial relations with Russia although France is probably the most extreme current example. The reliance of many NATO members and Ukraine on Russian gas also complicates relations. France has had varying statuses within NATO for the last 65 years. The French have this irritating tendency to put their own national interests first and the power to build significant conventional and nuclear military forces. It usually takes around 30 years to develop ICBMs and also the related nuclear weapons - so Australia would take too long to counter Russia, China and maybe India. The logic of relying on the US nuclear umbrella ("extended deterrence") makes more sense and is a major benefit of Australia's relationship with the US. 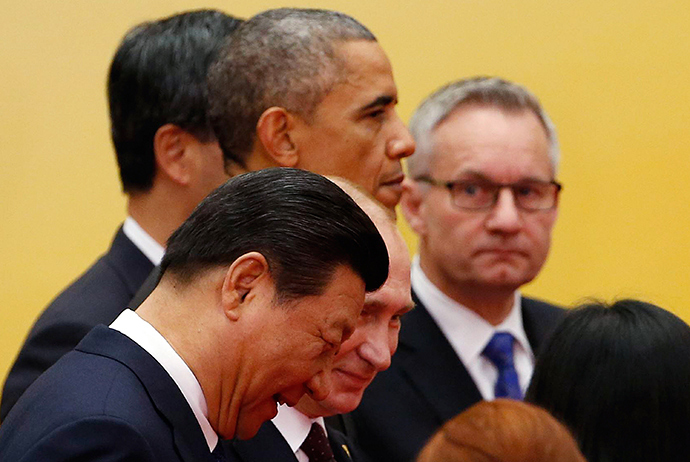 Yes Putin cracks a smile http://rt.com/files/opinionpost/31/de/b0/00/1.jpg in his off-guard moments - but do you reckon this is more typical http://youtu.be/K9g36QB5uos ? - Australia is OK for helicopters although the Tigers have come in very late and over-budget. Progressive Pat, I side with D.G. here. We spent years testing rockets at Womera, and are even building smart bombs. We know how to make stealth bombers/drones to deliver them anywhere. We invented the pulsed laser light uranium enrichment, and could even build bombs here. We invented the scram jet, more that a capable vehicle for delivering such devices, and from a relatively safe distance; launched from the belly of a stealth bomber, delivered by remote control and via the stratosphere. All well and good; given the huge gap between knowing and doing; talking and walking. Were we serious, about self defense self sufficiency/reliance, we would up the defense spend to at least 5% of the matching that, with defense related R+D! The problem here is a government hell bent on doing S.F.A. and or, politically expedient sweetheart deals? If we were serious about intended self reliance!? The very first thing to go would be our tax system, with more holes than Swiss cheese; and which virtually allows those, mostly foreigners, earning the biggest profits, to escape with paying little if any tax! The second would be the junking of the heritage listing of the GBR, to ensure we have the fuel needed to fight any self defense effort indefinitely. And don't forget, defense industries need energy/communications; simply cut off by a few well aimed missiles, that shut down the national grid! We currently have one weeks worth of reserve fuel! A thousand fighters are worthless if out of gas and stuck on the ground; ditto amour, ships and subs, and just waiting for a pearl harbor style attack, to ram the, wet paper bag message home!